Stress fractures are relatively common to the metatarsal bones. They occur when a patient's activity level over a short period of time has been drastically increased. This can occur in a patient that starts a training season for track or any type of running the sport. It can also be seen in military recruits when they start their training season. Stress fractures of metatarsals are also common in women who change their job and all of a sudden have to wear a high-heeled shoe consistently. This puts stress on the metatarsals and causes a small fracture. 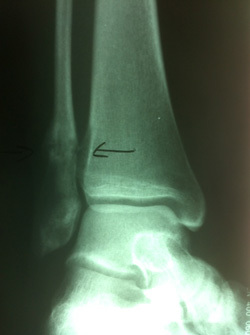 Stress fractures are often a clinical diagnosis as x-rays may be negative initially. The patient would typically experience pain and swelling across the top of the metatarsals. The pain would be mild in the morning. However, would get worse with weight-bearing. 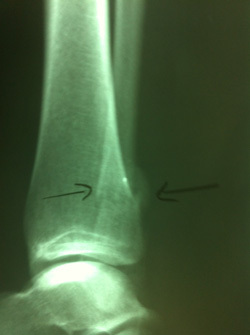 When x-rays are negative these problems are still treated as a fracture. X-rays taken 14-21 days after the injury will often show healing of the stress fracture by bone callus along the shaft of the bone. 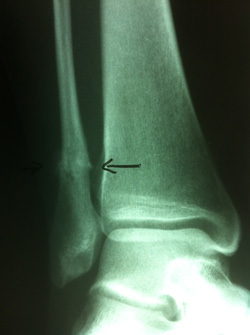 Stress fractures that occur towards the end of the bone in the metaphyseal region often go nondisplaced after the healing process. Stress fractures that occur in the midportion of the metatarsal can displace up, causing the potential for future problems in the metatarsal head region. Diaphysial stress fractures of the fifth metatarsal are more uncommon. These fractures are in an area of the fifth metatarsal bone that has a very poor blood supply. 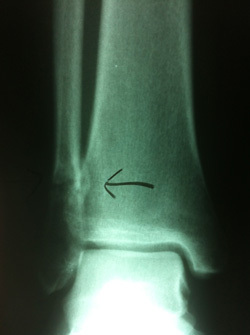 These fractures are often treated with eight weeks nonweightbearing. In rare cases, the fracture does not heal and it may require a small screw to be placed through the bone to allow the fracture to heal. In athletes that do a lot of running or those who have a foot that has a slight turning in of the front part relative to the back part of the foot, surgery may be indicated earlier due to the high propensity for refracture following healing of the primary fracture.